Cruise ships dock right next to the Aloha Tower in the center of Honolulu. Aloha Tower Marketplace is a conveniently located waterfront attraction at the historic Honolulu Harbor. Just 15 minutes from Daniel K. Inouye International Airport , and 10 minutes from the World famous Waikiki Beach, it's an easy drive over, ride the red line trolley or the City Bus. Enjoy unique and captivating shops, waterfront restaurants, and a "melting pot" of daily music and entertainment. Discover Hawaii's premier getaway for dining, shopping, and just plain having fun. On the top floor, the observation deck reveals a breathtaking view of Honolulu Harbor. It's open from 9 a.m. to 5 p.m. daily and admission is free. NCL uses pier 2 which is about 400 yards to the south. The Island of Oahu is Hawaii all on one island and truly is the heart of Hawaii. Oahu is home to Hawaii's State Capital, Honolulu, and often nicknamed "The Gathering Place", attracting visitors from around the world to enjoy the unique culture, natural beauty and Aloha Spirit. Discover the many sides of Oahu. Explore the lush, Windward Coast or take a beautiful, scenic drive to the legendary North Shore. Indulge in great shopping and dining in Waikiki and immerse yourself in the cool arts and culture scene in Hip and Historic Honolulu. Waikiki Beach is the center of activity for Hawaii's biggest industry: tourism. This is one of the world's greatest resort playgrounds, featuring some of the most beautiful beaches and hotels in the world. Visitors from all over the world flock here to enjoy the sun, the sand and the incredible nightlife. The history of Hawaii is very rich, as the islands have always attracted many different people. Visitors can tour the Tolani Palace, the residence of the last of the Hawaiian monarchs. They can also visit Honolulu's Chinatown, which is more authentic than many of its mainland counterparts. They can also visit the Arizona Memorial, commemorating the destruction of the battleship Arizona during the Japanese attack on Pearl Harbor that brought America into World War II. 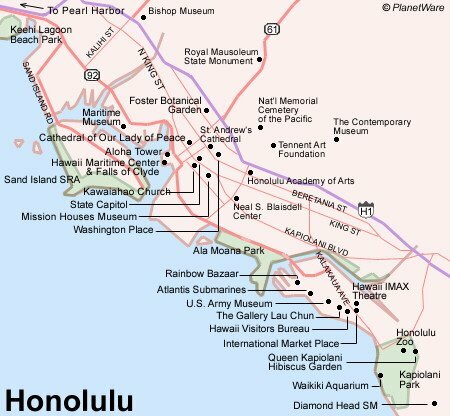 The Red Line Trolley or the "Honolulu City Line" provides a convenient transportation service to Aloha Tower Marketplace from 8 other locations including Waikiki. The trolley arrives every 40 minutes, 7 days a week, including holidays from 9.21 a.m. - 5:21 p.m. One day pass for all three lines is sold for $32.00 at the DFS Galleria trolley ticket booth in Waikiki and Ala Moana Center. If it is important to you to visit Pearl harbor and the USS Arizona (especially), get off as soon as you can, and then grab a cab (there will be cabs waiting) for Pearl Harbor. You should get there before tour buses get all their passengers rounded up, and you should get earlier tickets. Then if you get there early enough, you could visit USS Arizona, and then visit Bowfin, USS Missouri, Pacific Aviation Museum or head back toward pier. You could then take www.TheBus.org and maybe stop in Chinatown, or go on to Waikiki. Being on a tour bus does not guarantee tickets to USS Arizona. Tickets are give out on a first come, first served basis, and when all are gone for the day, they are GONE! If ship's tour is $49, taxi would be much cheaper--maybe about $25.00 - $30.00. The memorials and museums are about 9.5 miles away from where you are docked. Besides the beaches, visitors to Honolulu can take tours of the countryside surrounding the downtown area. These tours are amazing, bringing visitors to some of the most beautiful rain forests and volcanoes in the world. Animal and plant life are abundant, and the scenery is unsurpassed. A five-minute car ride from Honolulu brings visitors into some of Nature's most beautiful and awe-inspiring sights. Several museums, including the Bishop Museum, combine exhibits on Hawaiian natural history with lessons about history and culture of its many diverse peoples. The Waikiki Aquarium is the third oldest public aquarium in the United States, and it features many of Hawaii's most interesting sea animals. The Honolulu Zoo also features some of the unique mammals, birds, and reptiles that inhabit the forests just outside of the city. From Aloha Tower, you can catch free shopping shuttles to Walmart and Hilo Hatties. Ala Moana Shopping Center An international center of more than 200 stores and restaurants, Ala Moana is renowned as one of the largest open-air shopping centers in the world. It is a veritable shopper's paradise, with national and international stores from Banana Republic, Tiffany, and Neiman Marcus to Cartier, YSL, Louis Vuitton, and Burberry - side-by-side with unique surf apparel and gift shops that make "Hawaiian style" an experience like no other. It's no wonder more than two million people visit Ala Moana Center each month. Chinatown Shops Honolulu's 200-year old Chinatown is a wonderland of shops that feature herbs, fresh produce, fish markets, restaurants and a rainbow of fresh flower leis. Here a mix of Asian cultures is concentrated in an area where exotic spices infuse the air and the way to good health is through acupuncture and herbalists. Many WiFi cafes and malls around.